There is simply nothing like coming back after a busy day to your comfortable and an inviting living room on a cold winter’s day. The following are some hints to help you come up with a warmer look to your home during the winter season. You can inspire feelings of warmth and togetherness if you move your furniture closer together in the room. Furniture that is spaced more closely together gives the room a friendly look and makes conversing more easier. The furniture can be placed in a circle or have a minimum of at least two pieces facing each other. Use large throw rugs underneath the furniture to help add more warmth to the room and as a means of defining space, particularly in a large-sized room. When it turns cold outside, we tend to layer up our clothes to keep warm. This idea also will work effectively in the home when you layer the items such as window treatment, slipcovers tablecloth. Valances for the windows and decorative fabric toppers on the table can add a touch of the season to your space. For the bathroom, layering towels with two layers or more will also work and it will give you some extra space. When people think of warmer temperatures and sun, they think of nature, which is one thing we are sorely lacking during the winter season. Always try to introduce natural based elements into the design of your home when you can. Wooden furniture, small stones, area rugs made of bamboo – these are just a couple of ideas you can use. Another helpful hint is to use winter hardy indoor houseplants to fill in empty spaces. Candles not only add an elegant and fashionable look to your home, but they also provide an inexpensive source of heat and light. Just light a couple of candles instead of switching on a light to create an atmosphere of comfort and romance. Rooms that are smaller in size can have candles function as a centerpiece for the table. In more spacious rooms, the best placement for candles is alongside walls in order to provide a more consistent source of lighting. 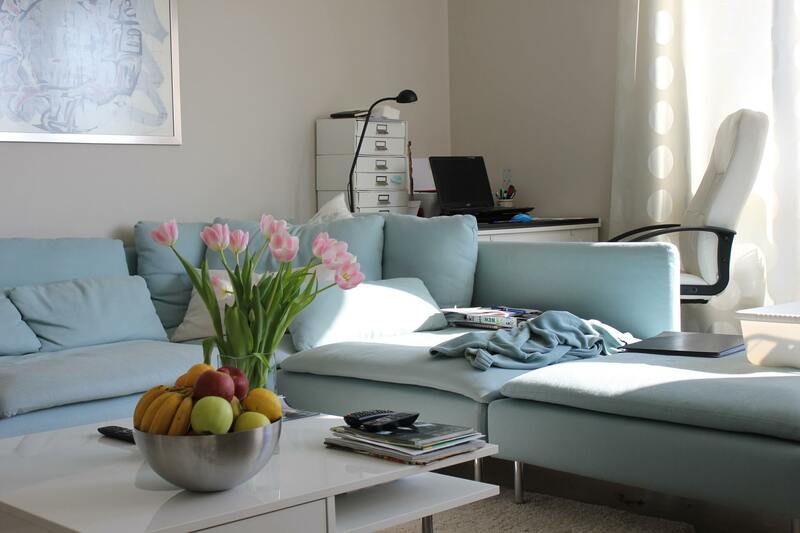 Heavier materials in deeper colors are the answer to making your home feel warmer in winter. The most commonly used materials during the winter season for slipcovers and throws are velvet, wool, and fleece. You can also add warmth to the room with area rugs. The way in which the majority of area rugs are constructed today is with good quality, the thick pile so the only thing you’ll need to worry about is which style to choose. Cotton area rugs or rugs made of jute will be much more budget-friendly, but will still add in a whole new layer of comfort and warmth. The colors that you choose for your living room will create a visual feeling of warmth. The color palette for winter should mainly center on colors in the red to yellow range. You’ll need to take into consideration that warm colors are more intense looking and need to be counterbalanced with different colors in the spectrum. One example would be using blue throws or green area rugs as contrast for the strong colors or adding in earth colors such as browns and beiges to tone it down. Using all of these tips and suggestions in your own way, with a dash of creativity to boot, you can create your own personal winter space at home this season. Create a place that you feel good being in and that you will enjoy inviting friends and family to. The above are some of the ways in which you can decorate your home for winter. Try them out and be assured of getting the best results. Do it now!